We’ve been arguing for a while now that the economy and markets are on the road back to normal. In fact, we recently observed that the economy has reached that condition, and we are now waiting for the market to catch up. Accelerated GDP growth and the early signs of inflation—mostly being felt in increased commodity, raw material, and other input costs—are more historically familiar economic territory. History also shows that these developments are typically coincident with rising interest rates. So far, though, the 10-year Treasury yield has stubbornly refused to acquiesce to history—making the 10-year the major road block on the path back to normal. But with other developments firmly in place, including short rates that are on the rise, we believe that the upward trend in rates is under way—and we suspect that the 10-year yield will begin to move up more consistently over the next year. As small-cap specialists, we see all this as healthy. Once again turning to history as our guide, we find that periods of rising rate have been favorable for small-cap stocks on both an absolute and relative basis. 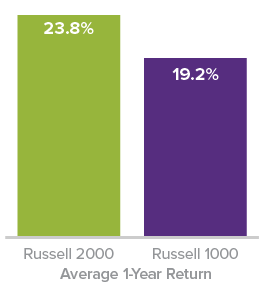 When the 10-Year Treasury yield was rising, the Russell 2000 Index outperformed the large-cap Russell 1000 in 70% of trailing monthly rolling one-year periods for the 20-year period ended 6/30/18, with an average one-year return of 23.8% versus 19.2% for large-cap. 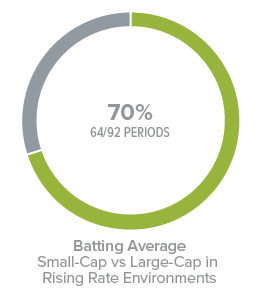 How Have Small-Caps Performed When Rates Are Rising? 10-Year Treasury Yield rose in 92 of 229 periods. More specifically, we see rising rates as a phenomenon that should also be helpful to risk-conscious active managers in the small-cap space—primarily because it fosters an environment where better balance sheet companies are likely to be rewarded for their fiscal prudence. In other words, risk management matters. This is especially relevant today because of the increased leverage—specifically financial leverage—within the Russell 2000. And as rates continue to move up, the small-cap index looks increasingly risky. As active managers, we have the ability to screen and scrutinize small-cap businesses with better balance sheets and shy away from those with what we see as having excess financial leverage. And it’s worth mentioning that the market has largely ignored better balance sheet companies for much of the last 10 years. Most of our strategies gravitate toward companies with low debt. 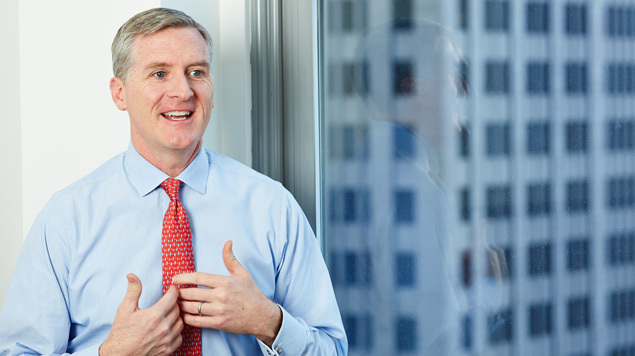 We’d rather focus on companies that have great operating leverage—but not financial leverage. The market seems to be transitioning into an environment that will favor similar qualities.